In college at UC Santa Barbara (number two party school, thankyouverymuch), I spent more money than I’d like to admit going out (as in, to the bars downtown) every weekend. At least one night a week, be it Thursday, Friday, or Saturday night, I’d shell out money for the pre-game refreshments, transportation, cocktails, drunk munchies, and eventually, the panic-inducing moment when I’d realize the last opportunity to take the (cheap) Bill’s Bus had passed and now I’d be forced to pay for a nearly $50 cab ride back to Isla Vista. 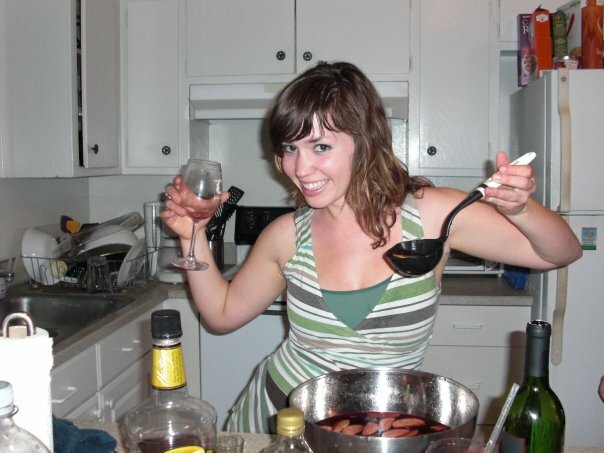 Making quick sangria. Probably not racing in the morning. Not every night totaled the $100 in this scenario, but some nights it would happen. What would I get out of it? Great memories, most definitely. Bonding time with friends. A huge hole in my bank account. Empty and mostly unnecessary calories. I try to keep this in mind when I hesitate to sign up for a $70 half marathon or grimace at my gym fees. Hobbies change, and at least this time I’m trying to better myself. Apart from the cost of going out to the bars, there was the emotional and physical cost. I have and probably always will be a morning person, and sabotaging my morning with an exhausting hangover made me mad at myself, especially in a place like Santa Barbara where outdoor exploration is endless. Registering for a race is much more of an investment, and I like that out of the same amount of money as I’d spend bar hopping, I attain goals, a purpose to my workouts, and something to look forward to for the next few months – minus the nasty hangover.